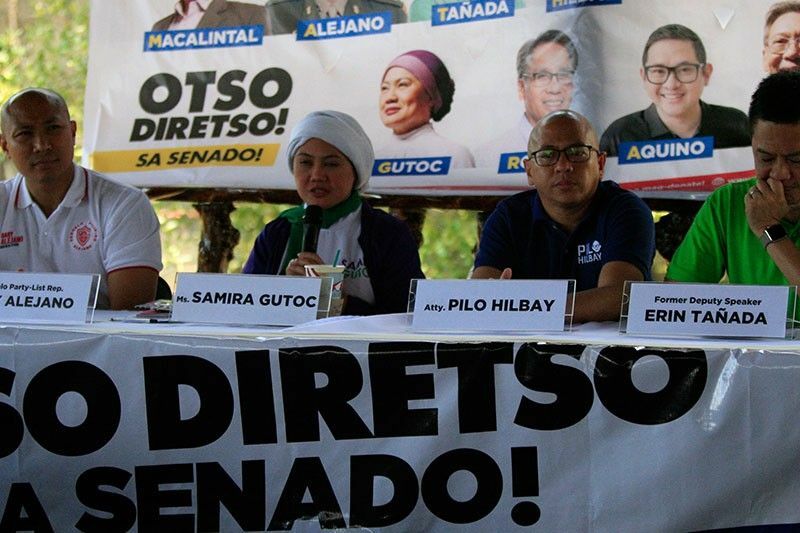 In this March 20 photo, "Otso Diretso" senatorial bets Gary Alejano, Samira Gutoc, Florin Hilbay and Erin Tañada talk at a campaign sortie in Navotas City. MANILA, Philippines — Candidates from an opposition coalition have expressed support of former Foreign Affairs Secretary Albert del Rosario and former Ombudsman Conchita Carpio Morales for filing a communication before the International Criminal Court. The two former government officials urged the ICC to conduct a preliminary examination into Chinese President Xi Jinping over Beijing's encroachment of the South China Sea. ICC correspondence vs China's Xi: What happens next? In a communication submitted to the court a few days before the withdrawal of the Philippines took effect, Del Rosario accused Xi of committing crimes against humanity. "These acts of Chinese officials and nationals inflict food and livelihood deprivation to the inhabitants of the coastal States in the South China Sea, which therefore constitute 'inhuman acts... intentionally causing great suffering, or serious injury to body or to mental or physical health,'" the communication read. Former Solicitor General Florin Hilbay, the Philippines' main agent in the arbitration against China filed in 2013, also expressed support for Filipino fishermen who have been affected by China's bid to fully occupy the South China Sea. Hilbay blamed the Duterte administration for allegedly failing to protect the country's sovereignty through perceived inaction over the 2016 arbitral ruling that invalidated Beijing's expansive claims in the contested waterway. "If this government will not defend us and our future generations from China's occupation and destruction of our resources, we will," Hilbay said in a statement released Friday. Rep. Gary Alejano (Magdalo party-list), who earlier revealed that Chinese ships have been occupying sandbars near Pag-asa Island in the West Philippine Sea, said the communication was a "slap" to the government for failing to exact accountability against the transgressions of China. "The Duterte administration is a failure. In the face of China, it is nothing but a pet bowing down to the marches of its master. This is betrayal to our nation," Alejano said. The former Marine officer called on the military and the Coast Guard to be steadfast in protecting the country's territory. Lawyer Romulo Macalintal, meanwhile, said the Duterte administration should have called the attention of the ICC over China's actions a long time ago. "It is disappointing that this government chose to side with the interest of China rather than its own people. We call on the public to support Del Rosario and Carpio Morales on their fight for the Filipino people," Macalintal said in Filipino. Former Rep. Erin Tañada (Quezon) stressed that the rights to life and livelihood are fundamental human rights. "Our fisherfolk showed more guts and patriotic concern than some of our government officials who are now reduced to being mere Chinese lapdogs in the face of blatant encroachments by China on internationally adjudicated Philippine territory," Tañada said.